Prediger road late at night. Hiking in and setting up a hammock across the stream. Sleeping late. Hiking around the bend, seeing clouds racing over the ridge. Up and down over the peaks. Getting turned around at the overlook. Camping near the lean to in the dark. Rain at night. Racing up to Plateau, then returning. Hitching a ride back. The summer had been very busy, and I had not been able to get out hiking even once, so when I found a free weekend, I decided to make it a backpack, and to try for several peaks. I drove up Friday evening, arriving at the end of Prediger Road after 10:00 PM. I pulled in to the parking area, the only car, and a nearby resident immediately came out to tell me I could not sleep in the car. I was prepared ! I packed up, got out the flashlight, and started up the trail. Starting out at night is always a little unnerving. It is always foggy at night ? 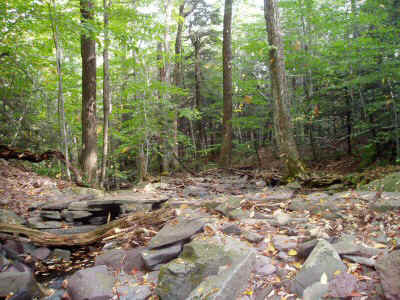 I hiked about a mile, then veered off the trail, crossed a stream, and made sure I was out of sight. Then I hung up my hammock and fell right asleep. I guess I must have been really tired, because even though I thought I was getting up early, it turned out to be almost 10:00 before I was out of bed. Since I had not unpacked, it took only a minute to break camp and get going. This is the first stream crossing. A light breeze was blowing, and the leaves were gently raining down from the trees. I made a short side trip to the lean-to, and explored the large flat area above it. It looks like it could accommodate at least ten parties. Even though it was not raining, it was exceedingly damp, and I never able to get dry for the whole weekend. At this overlook I ate lunch, admired the view, and tried to get my shirt to dry off. Eventually I had to put it back on wet (and cold). 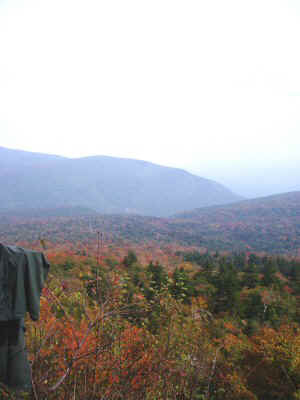 As I crossed Indian Head, then Twin, and then Sugarloaf, the views were frequent and lovely. It was windy up on the ridge, blowing clouds mostly. I did not stop for long at any place. At one overlook I somehow got confused, and hiked back the way I had come. I must not have been paying attention, for I walked almost an hour before I began to get the feeling (1) that I should be at the notch, and (2) that this looked very familiar. So I turned around, crossed the same ground a third time, and eventually wound up where I had been before. The trail there was indeed confusing, and I had to be very careful not to loop back yet again. Because I had gotten such a late start, and had lost two hours being confused on the trail, I descended the last half mile in the dark. I had to be extremely careful not to get off the trail, which was very steep. I was relieved to get to the Mink Hollow junction. I searched a bit for the lean-to, but could not easily find it in the dark. It was again very foggy. So I headed a ways off the trail, set up my hammock, and sacked out. A couple hours later I was awakened by rain, so I had to get up and put on my rainfly. By the time it was secure, I was wet and the rain had stopped, but the fly let me sleep securely the rest of the night. 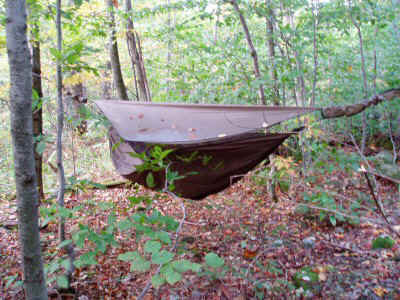 The hammock is really an ideal way to camp in the Catskills, since it is so hard to find a dry, flat place to lay out a groundcloth. It is much easier to find suitable trees. The next morning I arose early, took a leisurely stroll up Plateau without my pack, and returned to pick up my pack. I should have enjoyed the hike back to the road, since the weather was finally drying out a little bit, and since it was mostly downhill. But I was obsessed with catching up with a party ahead, so that I could hitch a ride with them back to my starting place. As it turned out, the parking area was full, with people coming and going regularly. Some nice hikers went a few miles out of their way to drop me off. I was thankful that I did not have to walk back on the road.